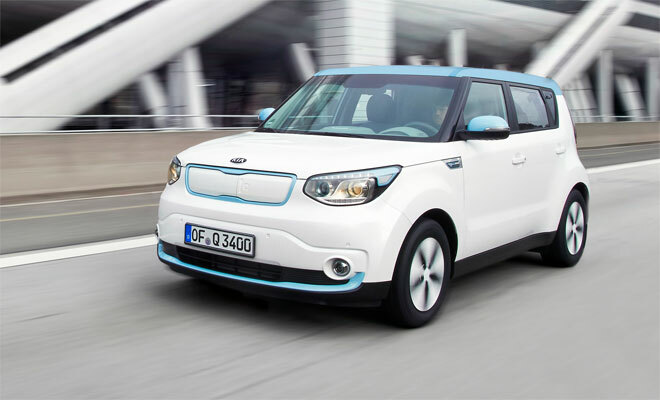 I’m not sure about the baby-blue-and-white colour scheme, but the upcoming Kia Soul EV looks as if it will be a well sorted vehicle when it goes into production in the second half of this year. UK models are due to arrive in the autumn. Kia says it has given the second-generation Soul a thorough going over during the process of turfing out the combustion engine and slotting in batteries and a motor. Additional bracing plus an extra dollop of high-strength steel has stiffened the body structure, keeping it rigid while lugging around the big lump of lithium-ion battery, mounted low down between the axles. In general, increased stiffness allows engineers to fit more comfortable suspension without sacrificing agility. 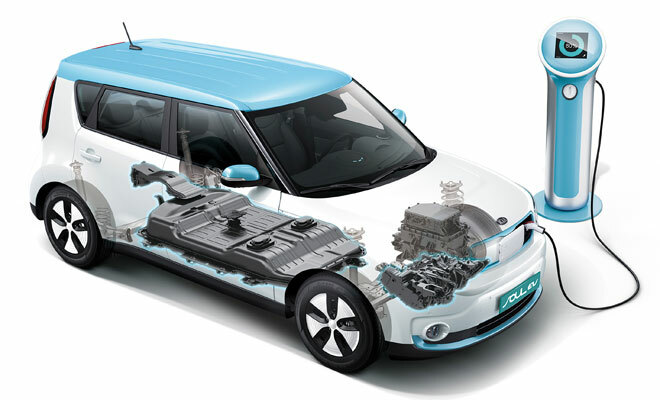 The Soul EV’s battery stores 27kWh when fully charged – somewhat more than the 24kWh of a Nissan Leaf – and Kia is claiming that it has crammed all this charge into a lighter-than-average package. It hasn’t revealed the mass of the complete battery, or indeed the complete car, so we will have to wait for the weight, so to speak. The chosen battery chemistry is one of the leaner options, Kia says, while the polymer packaging of the cells also cuts heft. On the other hand, active thermal management (good for battery longevity and cold weather running) will tend to add lard, compared to the Leaf’s simpler, air-cooled approach. The Soul EV can be charged at up to 100kW DC, for a 25-minute 80% top-up, or up to 6.6kW AC, yielding a full charge in no more than five hours. The latter option implies a 30-amp wallbox, so a simple socket and mains cable could potentially take twice as long. Driving range between charges is quoted as 200km (124 miles). Propulsion comes courtesy of an 81.4kW (109bhp) motor, offering up to 285Nm of torque and driving the front wheels through a fixed-ratio transmission. The Soul EV will zip to 62 mph in under 12 seconds, and will hit 90mph when pressed. These figures all thud down in roughly the same ballpark as the Leaf. Also like the latest Leafs, there’s a gearstick-controlled choice between coasting and brake-energy recapture when you lift off the throttle – though it seems the new Kia won’t match the five selectable levels of regen seen in the VW e-Up, or even the quartet of paddle-chosen options in the Smart ED. 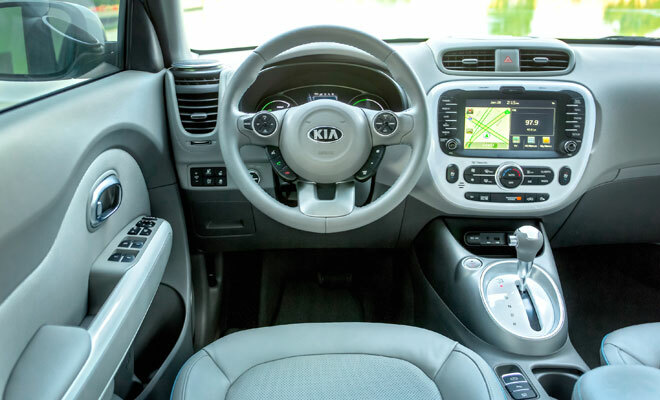 Plenty of attention has been given to the energy-sapping issue of keeping your fingers and toes toasty in the Kia. There’s the sensible option of pre-conditioning – adjusting the cabin temperature while the Soul EV is still plugged in – as well as an efficient heat-pump for providing warmth. Heat pumps use air-con technology in reverse, effectively chilling an already cold outside world in order to heat the cabin. It may sound like a harebrained notion, but the result is several times more efficient than any direct means of turning electricity into hot air. Heat pumps feature in all but the entry level Leaf, in Renault’s Zoe, and on the options list of BMW’s i3. Kia has also added a few new twists to the climate conundrum – the inevitable trade off between driving range and cabin comfort in very hot or cold weather. Firstly, there’s active management of incoming fresh air, via a ventilation shutter hooked up to temperature and humidity sensors. This keeps warm or cool air circulating in the cabin until it actually needs to be refreshed. Secondly, there’s a novel driver-only ventilation mode, which shuts off passenger vents to avoid wasting climate controlled air on empty seats. It’s probably best not deployed when a shivering spouse is aboard, unless you’d like the air to turn blue too. 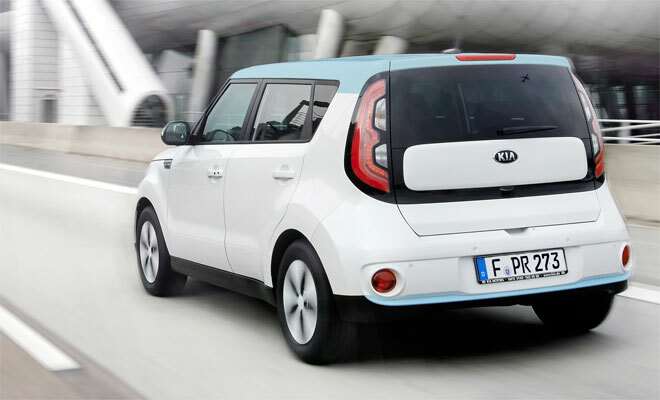 No word yet on how much the new Soul EV is likely to cost, or if Kia will offer outright purchase, battery rental or a choice between the two. We do know that Kia will offer a market-leading seven-year, 100,000-mile warranty. 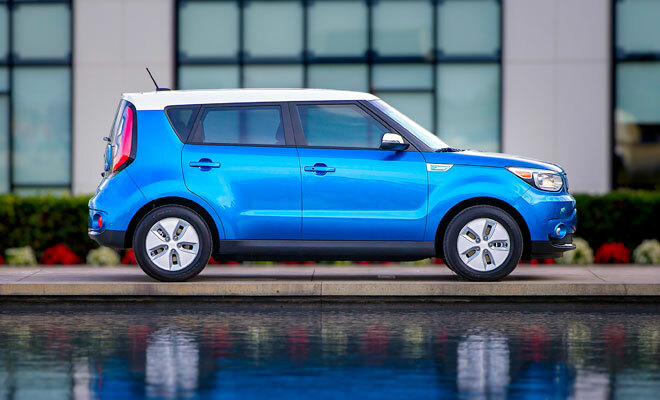 If I were a betting man, I’d wager that Kia’s Soul EV will be priced to compete head-on with Nissan’s Leaf.